We’d love your help. Let us know what’s wrong with this preview of The Broken and the Whole by Charles Sherman. A wise, uplifting memoir about a rabbi’s search for understanding and his discovery of hope and joy after his young son suffered a catastrophic brain-stem stroke: “Deeply moving, extraordinarily thought-provoking, and entirely humane” (Kirkus Reviews, starred review). As a young, ambitious rabbi at one of New York’s largest synagogues, Charles Sherman had high expectations A wise, uplifting memoir about a rabbi’s search for understanding and his discovery of hope and joy after his young son suffered a catastrophic brain-stem stroke: “Deeply moving, extraordinarily thought-provoking, and entirely humane” (Kirkus Reviews, starred review). As a young, ambitious rabbi at one of New York’s largest synagogues, Charles Sherman had high expectations for what his future would hold—a happy and healthy family, professional success, and recognition. Then, early one morning in 1986, everything changed. His son Eyal spiked a fever and was soon in serious respiratory distress. Doctors discovered a lesion on the four-year-old’s brain stem. Following high-risk surgery, Eyal suffered a stroke. Sherman and his wife later learned that their son would never walk, talk, feed himself, or breathe on his own again—yet his mind was entirely intact. He was still the curious, intelligent boy they had always known. The ground had shifted beneath the Sherman family’s feet, yet over the next thirty years, they were able to find comfort, pleasure, and courage in one another, their community, their faith, and in the love they shared. The experience pointed Rabbi Sherman toward the answers of some of life’s biggest questions: To what lengths should parents go to protect their children? How can we maintain faith in God when tragedy occurs? Is it possible to experience joy alongside continuing heartbreak? To ask other readers questions about The Broken and the Whole, please sign up. In early September the blog Zeh Lezeh (For One Another), which focuses primarily on disability and inclusion advocacy in the Jewish community, published a entry by Rabbi Charles S. Sherman about his son Eyal, who suffered a stroke after childhood surgery to remove a benign tumor from his brain stem. I think I had also seen an article in the local Jewish newspaper about Eyal and Rabbi Sherman's 2014 book The Broken and the Whole. I was looking for something suitably Jewish to read on Yom Kippur, In early September the blog Zeh Lezeh (For One Another), which focuses primarily on disability and inclusion advocacy in the Jewish community, published a entry by Rabbi Charles S. Sherman about his son Eyal, who suffered a stroke after childhood surgery to remove a benign tumor from his brain stem. I think I had also seen an article in the local Jewish newspaper about Eyal and Rabbi Sherman's 2014 book The Broken and the Whole. I was looking for something suitably Jewish to read on Yom Kippur, and luckily enough, my local library had a copy. The book was a quick read (I finished in a day, and didn't even give up my Yom Kippur nap). However, while the book has more details, I felt like it didn't add all that much to the 2 articles about Eyal I had previously read. Rabbi Sherman did include some interesting connections to Torah, but nothing that I find myself remembering and thinking about further once I put down the book. I found this to be a moving memoir of a family who sacrificed greatly to care for and nourish their severely handicapped son, Eyal. Although he could move nothing more than his mouth (he couldn't speak) and required around-the-clock care, his parents, Rabbi Charles and Leah Sherman, helped him to experience life to the fullest. He went to school, to malls and museums, graduated from Syracuse University, attends synagogue, and keeps up with current events. He is an amazing young man (now 32) beca I found this to be a moving memoir of a family who sacrificed greatly to care for and nourish their severely handicapped son, Eyal. Although he could move nothing more than his mouth (he couldn't speak) and required around-the-clock care, his parents, Rabbi Charles and Leah Sherman, helped him to experience life to the fullest. He went to school, to malls and museums, graduated from Syracuse University, attends synagogue, and keeps up with current events. He is an amazing young man (now 32) because his parents never gave up on him. Rabbi Sherman tells of the heartache, pain, joy, and lessons learned from caring for Eyal. In doing so, he gently encourages the reader to connect with others, give, have faith, persevere, be grateful,and have joy through trials. I was especially touched by the way Rabbi Sherman and his wife were committed to keeping their marriage strong through it all. They learned to laugh even in the darkest of times, to find comfort in one another, and never, ever let their heartache and burdens become justification to turn on each other. This is Wolf Blitzer's review. I could not agree more. I certainly could not say it better: This is truly an unforgettable and amazing story--heart-wrenching, inspiring, and ultimately reassuring. There's no denying the searing pain of heartbreak but also no denying the strength of the human spirit to carry on. I can't imagine a person that this wonderful book won't touch. I loved reading every page. I was quite grateful to author Charles S. Sherman for insights I gained into the This is Wolf Blitzer's review. I could not agree more. I certainly could not say it better: This is truly an unforgettable and amazing story--heart-wrenching, inspiring, and ultimately reassuring. There's no denying the searing pain of heartbreak but also no denying the strength of the human spirit to carry on. I can't imagine a person that this wonderful book won't touch. I loved reading every page. Unbelieveable story of our friend Erez's family. Grab some tissues. Most of us will face tragedy and trauma in our lives. 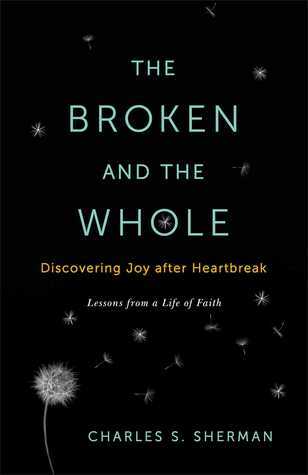 The Broken and the Whole offers you hope on how not to just survive but how to learn to thrive again. Encouragement abounds and hope follows. This is a well written book that is meant to be read and savored. I read it and sat it down so I could absorb the ideas being shared. May reading this book bring you the peace and joy that reading it brought me. NetGalley and Scribner provided an advanced review copy of this book in exchange for an honest review. The book was very personal and uplifting. The author does not sugar coat his feelings in this, making the book real. The book drove home the message that the circumstances of your life at a singular point in time do not have to define everything in your life. You have a choice to go on and adapt.